The Ventilation and Indoor Air Quality Group of the National Research Council of Canada (NRC) investigates a variety of factors influencing indoor air quality (IAQ), including radon. One of this article’s co-authors, Liang Grace Zhou, has led a team conducting research activities related to radon control in buildings since 2011, in collaboration with Health Canada’s National Radon Program. The most common techniques to prevent radon entry include active soil depressurization, increasing overall ventilation rates, and avoiding depressurization inside the building. These measures are frequently taken in combination with sealing soil gas entry routes in floors and walls. In Canadian homes, radon fans are usually installed in basements, meaning assessment of radon leakage through fan enclosures into indoor air is critical. 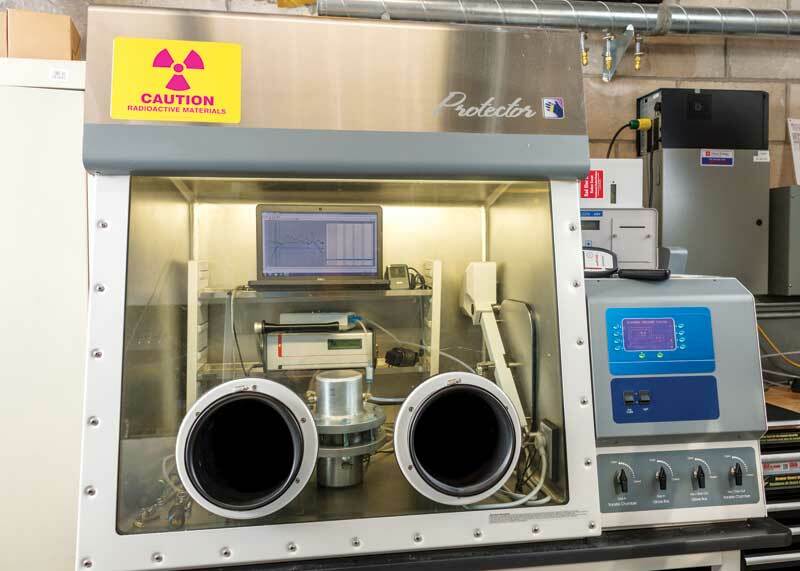 In September 2014, NRC’s radon research team, led by Zhou, successfully designed and constructed the world’s first radon fan leakage test rig to provide answers to four major manufacturers of radon fans in North America. Leakage through eight commonly used radon fans was determined using this rig. This project was the first in the world to scientifically examine radon fan leakage. Therefore, it serves as the only technical basis for radon fan leakage criteria to support Canadian radon mitigation standards currently being developed. Since December 2014, provisions in the B.C. Building Code for Zone 1 radon-prone areas have required the installation of a full-size vertical passive radon stack extending upward through the building and terminating above the roofline. In 2014 and 2015, the National Building Code of Canada (NBC) standing committee on housing and small buildings received two building code change requests to include such stacks in NBC. To help the standing committee address this change request, NRC’s radon group is currently undertaking a field study of extended passive radon stacks in homes across the country. The outcomes from the field study, combined with two years of lab work in the Canadian Centre for Housing Technology (CCHT) and the Indoor Air Research Laboratory (IARL), will help determine the efficacy of these stacks for radon control. The study will further facilitate development of a passive radon stack practice guide for builders and contractors, and ultimately assist the NBC standing committee in addressing building code change requests.